Back by popular demand – Flea Market Finds! At the end of each month I will post some of my better “finds.” Some months I do really well, other months I don’t have much luck! 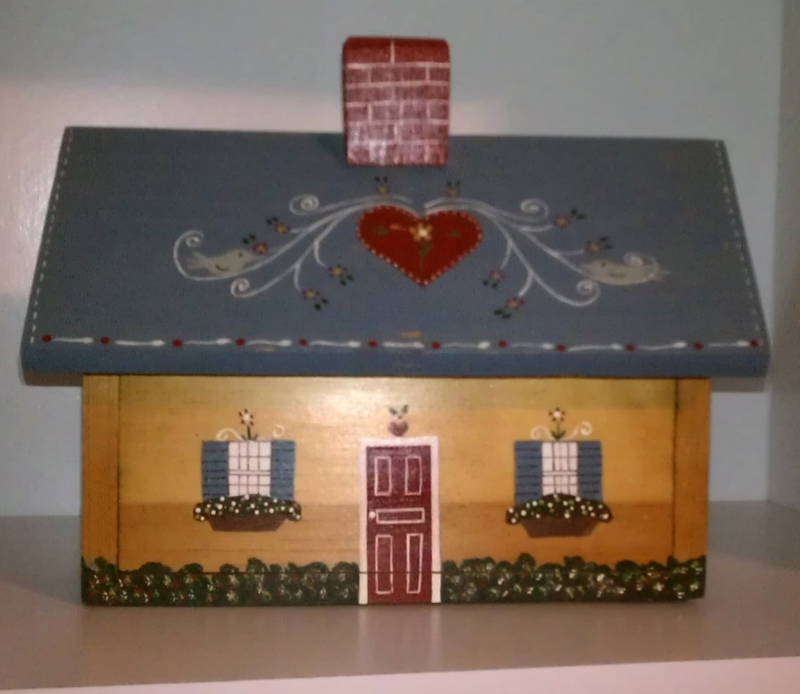 This is a cute little house box I found at the local thrift store. It is handpainted and the colors work great with the vintage red,white, and blue color scheme I have in my sewing room. The roof lifts off and you can store treasures inside. 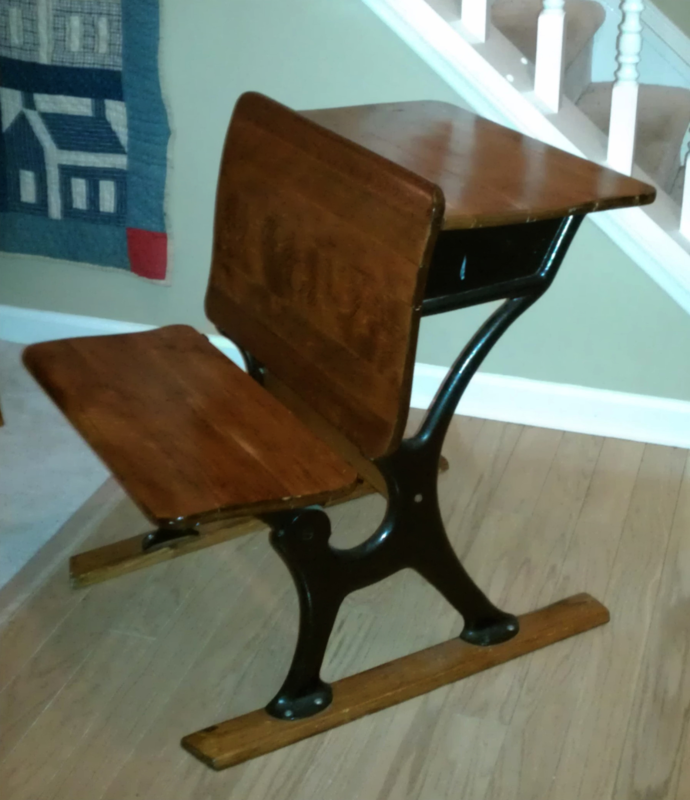 Next up is an antique school desk. This one is in exceptionally good condition – only one piece of gum stuck to the bottom! This particular model (Model 101) was manufactured by the American Seating Co. in the early 1900’s. There is an fascinating history of theater, school, and bus seating on the American Seating Co. website. The frame is made of steel and the seat flips up for easy storage. This may go in the entranceway – the perfect place to sit while you put on or take off shoes. There is a store in downtown Apex called The Rusty Bucket owned by Pam and Mack Thorpe. They carry all types of antique and primitive items and I go there all the time to see what “new” things they have. I was lucky enough to be in town last week when they hosted “The Gathering”, a huge sale that featured all the wonderful antiques that Pam and Mack found when they went “pickin'” in some old barns. 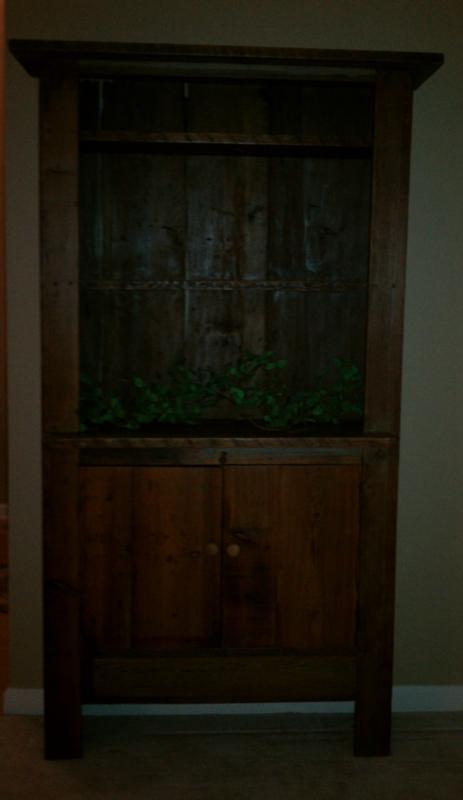 The biggest thing I bought was a wooden cupboard made out of old barnwood. I needed something like this for the house to add some height to my living room. I’m not sure how old this is, but it definitely has some authentic distressing and works great with the other primitive things in the house. This thing is very heavy and so once I find a place for it – it won’t move! The last thing is my most favorite find (sorry Barbara, you can’t have it!). 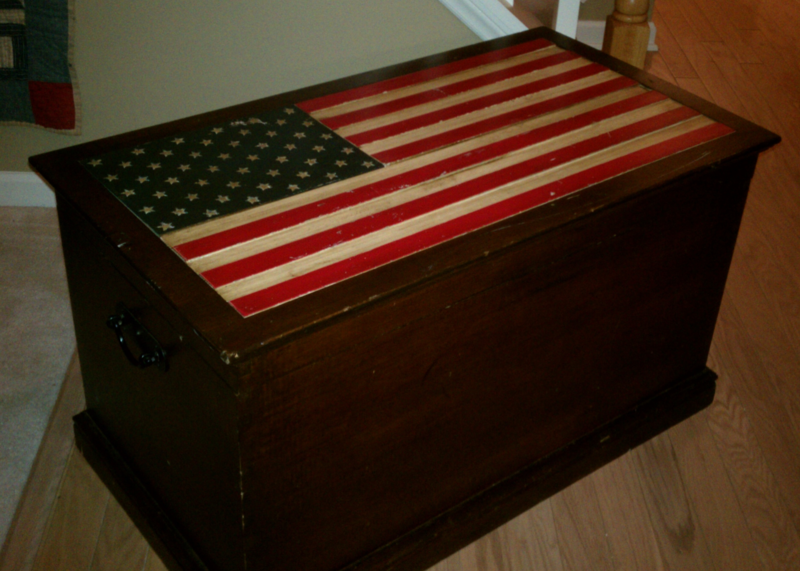 It’s a vintage trunk with an American Flag carved into the top. There are 50 stars on the flag, so I assume it was made in the 1960’s. It is made of a nice heavy dark wood, and there is a tray inside that lifts out. Not sure where this is going yet, but I am sure my decorator (Liberty Rose) can help me figure it out! In other news, I have a few sewing things I am working. I will also be posting a tutorial next week for a fun Valentine’s project. This entry was posted in Flea Market Finds, Household, Vintage. Bookmark the permalink. I love the schoolhouse quilt hanging on your wall; very beautiful. We retrieved two desks when my husband’s elementary school was torn down and kept them at my husband’s office for when our kids went there and needed a place to play. Looks like January was a very good month for you! Thank you! I love the school house block and was happy when I found that quilt (another flea market find 🙂 ). well done!!!!! Some of the items would look so much better in my house!!! True, but you have some things that would look better in my house! Wow, I love the flag box. That is something that I would have bought myself. The desk is like the one that I used in the sixth grade. We were in an old white wood building on Edinboro campus and it was all furnished with old things. The desks were fastened together on an iron bar and our row was agains the wall. It made a nice place to store items between the bar and the wall that wouldn’t fit into the desk. Our teacher called our row Pig Pen Alley. Of course everyone wanted to be in our row but at that time we all had to sit in alphabetical order so I always had the same front row place. However, I was not given the honor of being the mayor of Pig Pen Alley that was given to Dennis Holt. In those years people didn’t give jobs like that to girls. You would have made an excellent Mayor! Maybe you can run for the position now. I’m all over wanting to be part of Pig Pen Alley. I have become a neat freak. I think that is why I don’t like crafing. It makes too much mess. So true! I strings and fabric bits all over the place! Would you by any chance know the value of the Vintage Flag Trunk? I just bought a flag trunk would off I had never seen one before thought it was very cool I’m wondering if you have an idea of the value ? Hi Sarah, I don’t know the value of the trunk. I’d like to know too! I used to have this same trunk! I purchased it at a store in Tracy california in 2003 for $200.00. We unfortunately parted ways in a divorce two years later but it was my favorite piece! I used it as a coffee table and media cabinet. I hope you love it!